CHUCK TODD:This Sunday, disaster and response. The mayor of San Juan, Puerto Rico lashes out at the Trump administration over recovery efforts. MAYOR CARMEN YULIN CRUZ:We are dying. And you are killing us with the efficiency. CHUCK TODD:President Trump hits back. PRESIDENT DONALD TRUMP:The loss of life is always tragic. But it's been incredible, the results that we've had with respect to loss of life. CHUCK TODD:And tweets: "They want everything to be done for them." We'll have a report from Puerto Rico this morning. Plus promises, promises, the Republicans say their tax plans gives everyone a tax cut, won't favor the wealthy, and won't increase the deficit. PRESIDENT DONALD TRUMP:Tax reform will protect low income and middle income households, not the wealthy and well connected. CHUCK TODD:I'll ask Treasury Secretary Steve Mnuchin whether those are promises the administration can actually keep. Also, Trumpism Trumps Trump. The President's base declares victory over the President's candidate in Alabama. ROY MOORE:I believe in the Second Amendment. CHUCK TODD:As Mr. Trump started a revolution he cannot control. My guess: Republican Bob Corker of Tennessee, who has decided it's time for him to get out of the Senate. And in the midst of those NFL protests, I'll talk to one of America's leading social critics, Ta-Nehisi Coates, about race, white supremacy and the legacy of our first African-American president. Joining me for insight and analysis are Joy Reid, host of AM Joy on MSNBC, David Brooks, columnist for The New York Times, Danielle Pletka of The American Enterprise Institute, and MSNBC political analyst Charlie Sykes. Welcome to Sunday, it's Meet the Press. CHUCK TODD:Good Sunday morning. When the history of the Trump presidency is written, we may look back at this week as one of the worst for this president. Consider: His Secretary of Health and Human Services, Tom Price, had to resign over his free spending on charter flights. His latest effort to repeal and replace Obamacare went belly-up without a vote. This week's tax reform rollout seems to have focused more on what it does for corporations and the wealthy. And it's unclear what it does for the working class and the poor. Alabama Republicans defied the president by nominating insurgent Roy Moore over Mr. Trump's pick of the establishment. But the biggest story of all may wind up being what's happening right now in Puerto Rico. The mayor of the capital, San Juan, unloaded on the administration's response to the disaster there. MAYOR CARMEN YULIN CRUZ:So I am done being polite. I am done being politically correct. I am mad as hell. We are dying. And you are killing is with the inefficiency, and the bureaucracy. CHUCK TODD:President Trump responded with a series of tweets yesterday, including this one: "Such poor leadership ability by the mayor of San Juan and others in Puerto Rico who are not able to get their workers to help. They wanted everything to be done for them when it should be a community effort. 10,000 federal workers now on island doing a fantastic job." Tammy Leitner, my colleague at NBC News, asked Mayor Cruz if she felt Mr. Trump was personally attacking her. MAYOR CARMEN YULIN CRUZ:I don't care. He can attack me all he wants. You know, bring it on. I'm here. You know what? If it saves lives, because it gets the message in the right place, frankly my dear, I don't give a damn. CHUCK TODD:So let's get a reality check here. Ron Mott is standing by for us in San Juan, Puerto Rico. And Ron, we have this war of words between the president and the mayor of San Juan. You're there. Tell us the state of the recovery efforts. RON MOTT:Yeah, hey there, Chuck. You know, when you have an argument like this, the truth is usually somewhere in the middle. And I suspect that that's the case here in Puerto Rico. Things are not clearly as rosy as perhaps the president and the administration would have people believe. There is aid here, there's no doubt about that. And on the flip side, things are probably not as dire as the mayor-- made it sound the other night that-- the administration, in effect, is killing people down here. People have died, obviously. But making the connection between people dying and lack of aid and food and water here, that's probably a debatable point. But I can tell you this, Chuck. I've covered a lot of these storms and the aftermath of these storms. Life here is very, very hard. It is bad. There's no question about that. But that is the usual case after a major hurricane like Puerto Rico experienced with Maria. The thing is that we have not seen here is usually, 11 days out, as we are at this point after Maria, you see a lot more infrastructure in place, supplies, runs down the highway, convoys of military officials. We're not quite seeing that. Yesterday I saw one electric line truck yesterday, and there was no one up in a cherry picker putting the line back up. So let me set the scene for you and what these folks are dealing with 11 days out: 95% of the island still in the dark. It is hot. It is still-- hot here in the tropics. 80s, upper 80s, with high humidity. Yesterday it rained all day. So conditions here are miserable, where people trying to get by day to day. And that's how they're living down here. And in some cases, hour by hour. There are lines everywhere you see, Chuck. Lines to get gas, lines to get food, lines to get water, lines to get cash, lines to get into the grocery store, also to the drugstore. They're dealing with lines. People are spending considerable parts of their day standing in line, trying to get some need met. And in some cases, they get to the point where they are told, "There's no more gas." And so you can imagine how frustrating that is. It's enough to make a grown man or grown woman cry. So they are desperate down here, in many cases. I spoke to a retired police officer, lost his house, staying next door with his parents. They've got about a day, maybe two days' worth of food left. He says nobody has come to their neighborhood. Chuck? CHUCK TODD:Ron, what is the bigger issue here, supplies or distributing the supplies? RON MOTT:It's the distribution. We sat at the port yesterday. There was a lot of activity at the port. They were unloading a barge, container after container coming off the barge. But there aren't truckers sitting there waiting for these containers to be connected to their rig so they can get them out. Now FEMA did say that it has already distributed two and a half million liters of water here, two million pounds of food. We can't dispute any of that. But we can tell you that that port is not-- there's not a convoy of containers leaving that port going out into the communities with all these relief supplies. A lot of the stuff at the port, now we can tell you this, was not hurricane relief stuff. RON MOTT:These are goods that have been regularly scheduled to come down here. The truckers just can't get here. There's a little bit of silver lining perhaps coming tomorrow. Crowley, which is one of the big carriers there says that they are expecting a delivery, a major delivery of fuel tomorrow that is going to be met with a lot of applause here. Chuck? Before I get to the original topic we were going to discuss, which is the new tax reform plan you guys rolled out. I got to ask you about a couple things, maybe you can clarify as somebody who serves in the President’s cabinet. Um, what did he mean, um, by this idea that Puerto Rico, um, wants everything done for them? What did he mean by that? And why was the president -- appeared to be so angry in his tweets yesterday morning? Well, let me first say we very much appreciate the difficulty of what’s going on there. The devastation has obviously been very, very difficult and the president and the entire administration and the entire cabinet are very much focused on this. Uh, I’ve personally been involved in many aspects of this. Uh, I’ve been working with Secretary Perry on the electrical system, uh, you know, it’s, it’s -- we have put a priority to get the hospitals back up and running. We have electricity now to most of the hospitals. I’ve worked with the Federal Reserve on cash. You commented on issues with people getting cash in banks. We've literally sent in tens and hundreds of millions of dollars worth of cash, making sure we can get banks and ATMs open. And we're focused on food and water and everything else. This is something that is a very big focus of the president and the cabinet. We've been meeting almost daily on this. Why does the president think Puerto Rico's not doing enough to help themselves? Well, I think the federal government's role is working with the local government. And the governor's done a terrific job and we'll continue to work with him. This is something that's a partnership between the federal government, getting resources to the state so that it can be distributed there. Okay, you mentioned the governor, but you're not mentioning the mayor. Why did he attack the mayor? She's in a situation, a pretty desperate situation. He seemed to lack a little bit of empathy for the situation at the time. Why did he do this? How do you know they were unfair? Is that fair to say? Have you been down there? I haven't been down there. I mean is it unfair? I mean it's-- I remember going through Hurricane Andrew. When you're in this moment a week or so later and you still don't have power, any-- the president himself tweeted, a week after Sandy hit, "It's outrageous that power isn't on." People do get frustrated. Again, I completely understand people's frustration. And this is a very, very difficult situation. I haven't been there, but I've been almost on daily calls monitoring what's going on with the rest of the cabinet. I think FEMA's done a terrific job, given a very difficult situation. And we're doing everything we can to get resources to the governor so that they can be distributed. But I understand people's frustration on the island. And I can assure you the federal government's doing everything we can. Does the president, it seemed as if yesterday his tone changed on Puerto Rico. Does the president regret attacking the mayor and the people of Puerto Rico yesterday morning? I haven't spoken to the president about that, so I can't comment on it. But I don't think he was attacking the people. He understands that the people are going through a very difficult situation. All right, let me move to -- the tax plan here. I would say the way this was rolled out, it seems as if you're making promises that, if you can keep them all, it would be like Houdini trying to do this. That the deficit's somehow not going to go up, everybody's going to get a tax cut, but yet, the wealthy aren't going to benefit. Explain to me the philosophy of this. Is everybody going to get a tax cut no matter their income level? Well, first of all, I think your characterization of "similar to Houdini" is just not fair. I've been working on tax reform with the president since the campaign. He's been very consistent on what his goals are. His goals are to get a middle income tax cut. His goals are to make business taxes competitive. We have one of the highest tax rates in the world. We tax on worldwide income. We have a concept of deferral. This is really a jobs act. This is about creating jobs. And we've been completely transparent on the numbers and what this does to the deficit. All right. Is the working class and the poor going to get a tax cut? The middle class is going to get a tax cut? Is the wealthy getting a tax cut? The President's been very consistent. The objective is not to give an income tax cut to the wealthy. Okay, you said, "Income tax cut." Because the estate tax is a tax benefit to the wealthy, correct? The estate tax, also known as "the death tax," okay, we believe that people should pay taxes once and not twice. So I separate the income tax system from the estate tax system. The purpose of getting rid of the estate tax is so that people that have farms and people that have family businesses can continue to pass those on. So does anybody pay more? Again, we'll go through the details. As we have them, we'll have full transparency. But the president has been very clear. And I've been clear from the beginning. Our objective is not to create tax cuts for the wealthy. Our objective is about creating middle income tax cuts. But as you know, one of the things we're trying to do is eliminate lots and lots of deductions. One of those deductions is about getting the federal government out of the business of subsidizing the states. So this will have different impacts to people in different states. And we're sensitive to that. So the goal is-- you know, there's a lot of this tax plan, and it came through in the health care plan, too. It seems as if, at the end of the day, red states benefit, blue states get punished. Is this issue on the state taxes, not being able to write them off anymore, is this a way to just target the wealthy in blue states? Not at all. That's absolutely not fair and not the case. And what I would say about tax reform is it hasn't been done in 30 years. We're focused on changing the system. The system's broken. And most Americans understand that the system's broken. They're not happy with the difficulty of filling out tax forms. It's gotten harder and harder. And under our plan, 95 percent of Americans can fill out their taxes on a giant postcard. I mean think about the beauty of that in that what the money it saves, the money it saves at the I.R.S., and the simplicity of it. I've got to read you a quote, though, from Senator Bob Corker, who I'm going to have on later in the show. He said, "They're throwing sugar out on the table. You haven't even begun to deal with the spinach part. Not even a little leaf of spinach was thrown out on the table." I guess you could say the state tax deduction, getting rid of that, is your form of spinach. What else? I mean is anybody, are we going to take seriously the fiscal issues of this country with this tax reform plan? Because right now, you look at a lot of folks like Bob Corker, they look at it and say, "This thing's going to blow a hole in the deficit." Well first of all, I've had the opportunity to speak to Senator Corker in person and lots of others. And I went through the math with him. And the math I went through with him is, on a static basis, our plan will increase the deficit by a trillion and a half. Having said that, okay, you have to look at the economic impact. There's $500 billion that's the difference between policy and baseline. That takes it down to a trillion dollars. And there's $2 trillion of growth. So with our plan, we actually pay down the deficit by $1 trillion. And we think that's very fiscally responsible. For what it's worth, there has been no study that has been able to somehow reinforce this idea that tax cuts do translate to economic growth. The one time it did was when we went down from 90 percent with Kennedy down -- and got rid of that tax hike. But where is the analysis here? I know you guys scrubbed one from the Treasury Department on one having to do with corporate tax cuts. Where is the analysis that says this is going to lead to economic growth? As soon as the details are out, this will be scored by lots of different academics. We're happy to put plenty of economists on this show who support our plan. And we'll go through the numbers with you. So this will be fully transparent to the American public. And they understand that. This is about creating $10 trillion of GDP. This is about over $2 trillion of additional revenues to the government. And this is about jobs, millions and millions of jobs. Americans understand we have a broken tax system and this is about making us competitive and bringing back jobs. I want to go back. You are willing to have the president sign a tax reform bill that increases the deficit? There should be a healthy debate on those numbers. And that's why we've had full transparency on what these numbers will be. CHUCK TODD: Was it appropriate that Tom Price was fired? Uh, again, I can’t comment on -- he resigned. What I will say is appropriate is -- I think the American public deserved to know how their money is being spent and that it’s being spent carefully. Do you regret making the requests you made for government aircraft, whether it was to go to Kentucky -- I know there is an Inspector General on that one -- or the request you made, which I know was, ended up, withdrawn at the time? Do you regret doing that? SECY. STEVE MNUCHIN: Um, I don’t and let me tell you why. First of all, all of our travel went through the same process as previous secretaries of the Treasury. Every single one of my trips was approved by the White House. And the only time I’ve ever used or would use a private plane for government purposes if either there was a national security issue or we couldn’t get somewhere and that’s what this is about. So the Kentucky use of the plane was a mistake? No, I never said it was a mistake. It was approved by the White House and there were reasons why we needed to use that plane that are completely justifiable and we look forward to the IG report. Secretary Mnuchin, I appreciate you coming on. Thanks for sharing your views. Insurgent Roy Moore's primary went over President Trump's Senate candidate, Luther Strange, was big news this week. Yes, that also happened this week. And what happened in Alabama may not stay in Alabama. Senator Bob Corker of Tennessee won his last race by 25 points. Yet this week, he decided not to seek reelection. I sat down with him in the Senate Foreign Relations Hearing Room. He heads that committee. And I asked him about Moore's victory and if he, Corker, is getting out because the Senate is increasingly looking a lot more like Roy Moore and a lot less like Bob Corker. Why is the governing wing in the Republican party essentially, when I think about yourself or Mitch McConnell or Paul Ryan, why do you feel it's your wing that is taking the ire of this insurgent populist base? No doubt. But you know what I mean here. But you guys have all operated within the space of you try to pass what you can. Yeah. I mean, Washington for some time has not really been able to address I think the needs of people in our country. There are so many people in our country who have envisioned their life being different than it is today. So many of the people, hardworking Tennesseans and others, are not at the state in life that they thought they would be after they felt doing all the right things in life, working hard. Maybe they had a high school education. Maybe went to community college for a couple of years, raised their families, worked hard. And they find themselves, just from a standard of living situation, not where they thought. There's a lot going on. A lot of rhetoric has generated this, unfortunate rhetoric. But look, let me say, I wake up every day and, Chuck, it's a tremendous privilege for me to do what I do. We're sitting in the foreign relations hearing room. And it's such a privilege for me to do what I do. You said something about the president right after Charlottesville. You questioned whether there was a competency and a stability of the office of the presidency at that time. You still feel that way? --some of the competence and some of the stability. It might've been in reverse, but not yet demonstrated. And that we need for him to be successful. I mean, the country needs for him to be, the world needs for him to be successful. Look, I stand by those comments. You stand by them today? Meaning you still feel this way? Look, I think that General Kelly has brought in an air of discipline that has been transformative as far as how the White House operates. I do think they did a great job with Texas and Florida during the hurricane. Very professional. I thought it a lot of courage by the president to change his long held position about Afghanistan. So I'm seeing changes. But I made the comment. I stand by the comments I made at the time. I don't make comments like that without thinking about them. I know. I know you didn't do it lightly, which is why it made a big deal. I chose the words, I stand by those words. When I met with the president a week ago Friday, I said, "Mr. President, I stand by what I said." Oh, it was kind of humorous. I mean, it was. I mean, we spent about five minutes on this topic. He remembers any slight, doesn't he? Oh, he remembered it. You know, he said, "You called me incompetent." I said, "Mr. President." I knew it was coming, right? So I said, "Here's what I said--"
"Here's exactly what I said," yeah.
" --and I stand by these comments," okay? I stand by what I said. "Well, but the press said you said I was." I said, "Mr. President, here is what I said. Do you want me to read it again?" So, you know, in five minutes, we moved onto the other topic. You know, something struck me when I was thinking about this interview. When you were elected in 2006 and you took office in 2007, we had troops based in Afghanistan. And when you leave office in 2019, we're going to have troops in Afghanistan. When your successor contemplates a second or third term in the United States Senate from Tennessee, are we still going to have troops based in Afghanistan? The entire GDP of Afghanistan cannot support even their security forces. I'm talking about their own security forces. Now, you know, what matters, Chuck, is what are they doing. Okay, what are those troops doing? But are we likely to have troops in Afghanistan for the next decade? Sure. Two more quick questions. When you ran the first time, I looked at some of your early ads, you were a big proponent of the balanced budget amendment. So that tells me you're a deficit hawk. When this tax reform plan, tax cut plan, whatever it ends up looking like at the end of the day, the analysis says it's going to blow a hole in the deficit. First of all, what is a hole to you? Any additional dollar to the deficit? $100 billion? Where are you on this? So, I'm willing to accept the realities of where we are, and that is that we have a policy base. In other words, taxes. It's kind of like the dock fix. You know, we kept making up the fact that this was going to change. So I'm willing to accept current policy, number one. I think that's rational. And I'm willing to accept a reasonable score on dynamic growth. A reasonable score on dynamic growth. Joint tax does those. There're some other groups that do it. But if it looks like to me, Chuck, we're adding one penny to the deficit, I am not going to be for it, okay? I'm sorry. It is the greatest threat to our nation. The greatest threat to our nation. It's like, Chuck, we've entered a party atmosphere here. You know, everybody was a fiscal hawk, kind of. Not really, but kind of, up until the election. Now, it's like there's a party going on up here, okay? Heck with revenue. Heck with, you know, constraining spending. So yes, I will remain a deficit hawk until I leave here. And I’m looking so forward to this tax reform debate because the one thing that hasn’t been discussed is the four trillion dollars in base broadeners that have to occur for this to be successful, and every lobbyist in the world is gonna be up here fighting those. You know, it's amazing in retirement how many Democrats are coming out and saying they're going to miss you. I told people if I knew they were going to say so many nice things about me, I would've retired earlier. I mean, it's been wonderful. Look, I think I'm going to have more impact over the next 15 months than I've had in the last ten years. Well, I just think the issues. I mean, the first two years of a presidency is when most of the activity takes place. We're going to playing a leading role here in Iran here in a few weeks. Tax reform. And I look forward to working with all my colleagues here to make good things happen. You're going to be missed around here. Thank you, sir. Corker also told me economic pressure has not worked in North Korea, and we're going to end up with a binary choice. He's very concerned we've cornered ourselves there. 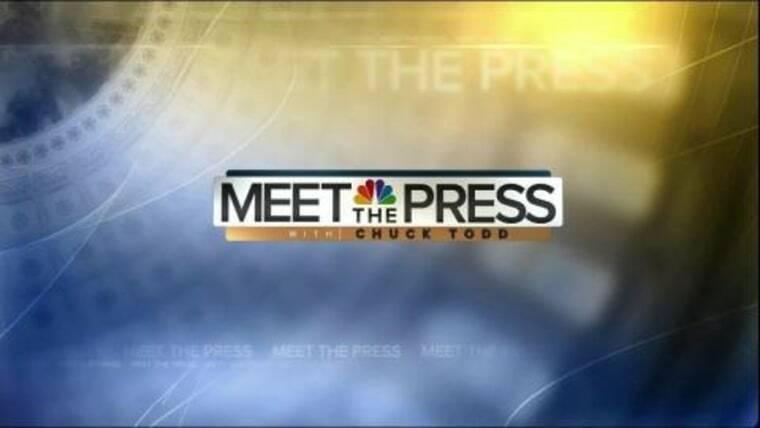 You can see the entire interview with Senator Corker on our website, MeetThePress.com. Coming up, it's too much to say if Puerto Rico is President Trump's Katrina. Remember all of President Obama's alleged Katrinas. But how much could the administration's response hurt the president long term? Welcome back. The panel is here: David Brooks, columnist for The New York Times, Joy Reid, host of AM Joy on MSNBC, Danielle Pletka of The American Enterprise Institute and MSNBC Political analyst Charlie Sykes, author of the book How The Right Lost Its Mind. There it is, the book jacket out there. A red hat, what does that mean there, Charlie? Geez, I wonder what that is. I've got to start with Puerto Rico. The president is tweeting again this morning on Puerto Rico, somewhat toned down. "We have done a great job with the almost impossible situation in Puerto Rico. Outside of the fake news or politically motivated ingrates, people are now starting to recognize the amazing work that has been done by FEMA and our great military. Our buildings are now inspected for safety. Thank you to the governor of PR and to all of those who are working so closely with our first responders. Fantastic job." Charlie Sykes, you tweeted yesterday, when the president went on his tweet storm in the morning against the mayor of San Juan, that he was sending talking points to his base, that that was the purpose of that tweet storm. No more. Well, it was kind of a dog whistle. Look, you know, Hanlon's Razor says, you know, never attribute to malice what can be adequately explained by stupidity. You know, so maybe you just have a president who lacks the self control, who just lashes out at any criticism. Yeah, but on the other hand, he did it in the context of a president who never wants to take responsibility. And what you had yesterday, you had 18 tweets in 11 hours where you saw thin skinned finger pointing, anger. You saw that kind of Trumpian "don't blame me, look at those other people who are incompetent down there." You know, very much the anti-Harry Truman. So that was a signal to his base and to his fan boys out there. But on the other hand, he's Donald Trump. He can't contain himself. Joy, here's what Erick Erickson wrote yesterday. He goes, "It should matter to all of us that the president is so willing to get in the mud and fight back when the mayor and everything else in Puerto Rico need our empathy and compassion. Sometimes the president just does not need to dial up the jackass, and sometimes he does not need to be defended. Yeah, but Donald Trump is just being himself, right? He's channeling his base. He's talking to them, but he's also channeling them. I mean before Donald Trump started tweeting, some of the more sort of prominent members of his base were calling the mayor even worse names than that. Saying she's a murderer, saying she belongs in jail. He's getting these signals, and he's giving them because he shares their view. And it is interesting that Donald Trump's reflex is to say that a woman, a woman of color, you know, is an ingrate, or to attack, or to say the people of Puerto Rico essentially are too lazy to help themselves, want something from the federal government that they won't provide to themselves. You know, he actually went on that tweet storm, which was the most he had talked about Puerto Rico at all, a year to the day after he attacked Alicia Machado, the former Miss Universe. Donald Trump has a particular reflex to attack women, to attack women of color, and to signal boost to his base this idea that people of color are lazy and dependent and won't do for themselves. He's sharing that with a large portion of his base. David Brooks, a lot of people see a pattern here. I mean because we forgot the gold star dad, Khizr Kahn, who happened to be Muslim. There was Steph Curry last week, an NBA basketball player of color. There appears to be a pattern. Yeah. Well, if you look at the Republican Party and you ask them, "Do you think there's as much discrimination against white people as against everybody else?" a large percentage say yes. How strong is white identity for a lot of Republicans? For about 47% of the Republican Party, the sense of being white, of whiteness, is a strong identity factor. For the other half, not so much a factor. They believe in conservative ideas are good for everybody. And Donald Trump is playing for the white identity party. And therefore, it's becoming harder, operationally, to be a Republican without suddenly siding with that. And so the other half of the party has to decide, "Can we side with a guy who's constantly dragging us into racial identity politics over and over again in a way that becomes offensive. I've been a conservative for 30 years, going to all these magazines, you never used to hear racial stuff at conservative gatherings." But now it's suddenly become very hard to be a Republican and not be somehow associated with something racially reprehensible. Dani, I was surprised that the secretary didn't have at least some pullback on the President's tweet on the mayor. think that the secretary has managed to please the president by defending him gently and deflecting effectively. The problem is exactly as David laid it out. The question is, "When do you want to separate yourself from the president? When do you, at a certain moment, decide that your own reputation, whether you're a Republican or just as an individual, is more important?" And this really is the great dividing line. This is where you see the people like Bob Corker separating themselves off. This is where you see people actually deciding, "I don't want to be part of this anymore." The question is why more of the Republican Party, frankly, why more conservatives aren't willing to do that. Erick Erickson has been very courageous throughout this. But I've been shocked by the number of people who aren't willing to stand up and say, "Hey, you're actually not speaking for me." Charlie, that's been the point of your whole book. --was, like, teeing you up here. But explain. Well, you know, I mean part of it is you do have the people who just made the Faustian bargain that they're going to enable, that they're going to look the other way because they're going to get tax cuts. And then of course you have the orange Kool-Aid drinkers who are doing all of that. And this is going to leave a stain on the Republican Party. This is going to leave a stain on conservatives for a generation. But, you know, let's go back to, you know, this comparison with Katrina, whether or not this is Trump's Katrina. This could actually be worse. Because Katrina was about indifference and incompetence. This is about mean-spiritedness. And also, the, you know, "let them eat cake" imagery that we're getting from this administration, yesterday was his 67th day spent at one of his golf clubs. And he's sitting at this golf club tweeting out attacks against a mayor who is, you know, wading through sewage, trying to save people's lives. People are dying. This is a natural disaster. This is understandable. So yes, it's race. But it's also with class. It's also competence. It's just the lack of human empathy. Yeah, I think it's important to separate the tweeting from the reality. You have-- with the NFL and Puerto Rico, these moments where we would normally come together as a country, and you have the president, who gratuitously stokes the cultural wars and turns this into political division. So the tweet, it's not just a tweet problem. -what are values are in this moment. The problem that George W. Bush had was an optical problem where he seemed indifferent. Donald Trump, to your point, is evincing malice. He's evincing what we eventually did see in Katrina, this idea that the people who were, you know, suffering in New Orleans were at fault, that they were people who were undeserving and unworthy. That had a racial component. This has a racial component. The difference is George W. Bush wasn't leading the white tribalism that did eventually get turned on the people in the Katrina situation. Donald Trump is leading it. And by the way, if he wonders if there isn't going to be an electoral impact, I introduce you to Central Florida on that. There are a lot of angry Puerto Rican voters in Central Florida that this may cost him down the road. When we come back, one of the country's leading social critics, Ta-Nehisi Coates. We're going to talk about race, white supremacy and those NFL protests. Stick around. Welcome back. For the second week in a row, more attention may be paid to what happens before NFL games as during. Will players take a knee during the national anthem? My next guest has spent much of his adult life thinking about race and its role in America. The Los Angeles Times described Ta-Nehisi Coates as "a critic whose magazine publications have become socio-literary events." His latest book, We Were Eight Years in Power, is a collection of essays written during the eight years of Barack Obama's presidency. And Ta-Nehisi Coates joins me now. Welcome back. Good to see you. Let me, right here, you, this is what you wrote about in the election. You were not subtle in pointing the blame directly at systemic racism and bigotry. And this is what you write. "The implications that systemic bigotry is still central to our politics, that the country is susceptible to such bigotry, that the salt of the earth Americans whom we lionize in our culture and politics are not so different from those same Americans who grin back at us in lynching phones are just too dark. Instead, the response has largely been an argument aimed at emotion, the summoning of the white working class, emblem of America's hardscrabble roots, inheritor of its pioneer spirit, as a shield against the horrific and empirical evidence of trenchant bigotry." You've said even tougher words about this president. You don't think he would be here without white supremacy. Well, I think it's pretty easy. I mean you have a political candidate who literally begins his presence or his campaign in birtherism. That was how it started. I don't think birtherism was a mistake. And it wasn't a minority-held opinion, or it wasn't a small minority-held opinion within the Republican Party. I mean you had eight years of an African-American president. And if not majority to at least plurality of the Republican Party believed that Barack Obama was not legitimate because he was not born here. And Donald Trump saw that, played on that, and that was how he launched his campaign. I just don't think that was a mistake. And he's continued with that all the way through. You have a president who had no problem going on T.V., saying, "Someone can't judge me. A federal judge can't judge my case because he's a Mexican." It doesn't get much more explicit than that. Solely a reaction to the election of Barack Obama? Do you think Donald-- do we get Donald Trump without Barack Obama as president? I don't think so. I don't think, without that reaction. Now that doesn't mean that there weren't other factors contributing to, you know, the Trump presidency, ultimately. I would argue that white supremacy is an indispensable factor. Which does not mean there weren't other factors that were there, too. But I think if you take that out, no. No, no. I don't think it's a mistake that we've never had a president who's never held political office or never you know been in, you know, had a military posting or anything at all, no experience within the public sphere at all, to just hand it off like that. I don’t--I think Trump is different. He's not Marco Rubio. He's not Mitt Romney. This is a very, very different thing. And I think, 50 years from now, historians are going to ask themselves how this actually happened. And I think the answer is going to be the reaction to Barack Obama's presidency. What was interesting is you share a moment, you were with President Obama a few days before the election in 2016. And neither one of you believed Donald Trump was going to win. And then, after the fact, you admitted you couldn't believe you thought that. --how many African-Americans, before 2008, in 2008, would say to me, "He can't win." And so it's interesting how this has happened. Well, I think the hard thing to believe is not so much the out and out racism and bigotry and sexism and et cetera and Islamophobia that was represented by Trump. There is a lack of, excuse my blunt terms, white self interest in this, that you have a president who is effectively conducting diplomacy, nuclear diplomacy, through tweeting. You would think like, you know, there's a line which says, "Okay, you know, I'm not going to endanger myself in this way." And that was proven to not be true. That was the shocking part. I want to ask you something about a comment that NBA Coach Gregg Popovich made earlier this week. Here it is. People get bored. "Oh, was it that again? They pull in the race card again. Why do we have to talk about that?" Well, because it's uncomfortable. People have to be made to feel uncomfortable. And especially white people, because we're comfortable. We still have no clue of what being born white means. Curious what you think. It's one thing when you say it. What do you think white people hear when a white man, an older white man, says it, says that, makes a comment like that? How important is it for an older white man to make a comment like that, in your mind? I'm not exactly sure. I hope folks, you know, hear it in a certain way. But I think the important thing that Pop was actually getting at that is that, when we talk about white, normally people think blonde hair, blue eyes, fair skin. They think certain physical features. And in fact, what we're really, really talking about, because those physical features have existed for a long time in this country, we say what we're actually talking about is ascribing power to those physical features. And that is the dark sort of ideology, the spirit, that Trump repeatedly conjures. And so I was happy to see that. You know, I was heartened to see it. You know, I hope it hit folks a certain way. What do you say to white viewers who are going to listen to you and say, "I'm not that way. I'm not a racist. I'm not a white supremacist. Don't ascribe all this to me." I would say that I'm not a sexist, either, but I'm deeply concerned about equal rights for women. I would say I'm not a homophobe, either, but I'm obviously deeply concerned about, you know, equal rights for the LG--LGBT community. It doesn't have to be me personally, or I don't have to feel it personally to realize that I am somehow also implicated collectively and oftentimes have privilege because of it. It was an interesting comment by the owner of the Cleveland Cavaliers. LeBron James made a pretty tough statement on President Trump. And the owner of the Cleveland Cavaliers went on CNBC couple days later and he talked about the reaction he heard. And he goes, the complaints he got, he goes, "It wasn't even about the issue that's really got me. They went to who they really are, some of them. There's an element of racism in this country that I didn't realize existed." Let me ask you this. Do you think there is, that there is an upside in our conversation about race in this country that will come from Donald Trump's election, that you have people like Dan Gilbert, who was supportive of the president, going, "I didn't realize how much racism there still is in this country?" No, no, I don't think so. I think this is a moment right now where people are seeing it. I think the capacity for people to forget should not be underestimated. And I don't say that just sort of blankly. We had a war in this country from 1860 to 1865 where large numbers of Americans died, and the price of slavery was made very, very clear. And immediately after that, people were very, very clear on that. Within about ten years, we were back trying to inscribe white supremacy in our laws. I would not be shocked if, in the moment, people are conscious, and I don't mean this as an attack on Dan Gilbert personally, but if the country eventually forgets. I hope I'm wrong. But that's what I think. Do you see, though, that-- is there two steps forward, one step back? Or do you see it as what we've experienced over the last 15 years as one step forward, two back? I see chaos. I don't know. I don't know. We'll see. Are you optimistic about your son's future in this country? I'm optimistic about my son. Ta-Nehisi, I'm going to leave it there. Congratulations on the book. And we'll be looking forward. The book is We Were Eight Years in Power. When we come back, that Republican revolution on the right, who's feeling it and who may be its next victims? And we are back, Data Download time. We've known for some time that the Senate map is a tough one for Democrats. But what happened with Roy Moore in Alabama might give Republican incumbents reason to worry. Here's what we mean. Moore was propelled to victory thanks to the same voters who make up President Trump's most loyal base: men without a college degree. In fact, only 23 and a half percent of people in Alabama have a bachelor's degree. Strange won with the state's highest educated voters. But Roy Moore won the state overall by ten points. Now take a look at all of the Republican seats up in 2018. Most of these will stay in the Republican column. Democrats are unlikely to pick up any seats in places like Utah or Texas. But if what happened in Alabama happens elsewhere, we could see a change in the type of Republicans serving in the U.S. Senate. And incumbents in states with lots of Trump-based voters might start to panic. Let's start with Senator Roger Wicker of Mississippi, who was already facing a possible Tea Party candidate from his right in a state with the second lowest percentage of people with a college degree in the country, 21%. And then there's Dean Heller in Nevada, who is facing challenges from his right and left. How about Tennessee, where Bob Corker's seat is now open, another seat with a low college-educated population? This is an antiestablishment, mostly rural movement. So even in states with slightly higher rates of education, Republican incumbents can't rest easy. Think about Senator John Barrasso in Wyoming, Deb Fischer in Nebraska and Jeff Flake in Arizona. To be clear, most of the Republican-held seats that we're talking about are pretty safe for the party overall. Two things could happen if more candidates are nominated from outside the Republican mainstream. It could give Democrats an opening to pick up more seats. We saw that in 2010 and 2012. Or we could see an increased polarization and more gridlock and more headaches for leaders like Mitch McConnell. We'll be back in a moment with Endgame. We're going to talk about this topic: Just how far will the Republican civil war go? Back now with Endgame. Let's go to the Republican civil war, David Brooks. I was amused by the people who were asked about Roy Moore, U.S. senators, Republican U.S. senators this week, after he won. Chuck Grassley: "If I've read anything he said, I wouldn't have any recollection of it." Here's Susan Collins, "I don't know him. I think I'll leave it there." And then Dean Heller with perhaps the most laughable quote: "Who won? I wasn't paying attention." This is a group of people that are not looking forward to a colleague named Roy Moore. Apparently Alzheimer's is contagious. The mention of Roy Moore closes it. Listen, the Republican Party, what strikes me about this week is they thought they could be the nationalists, the Steve Bannon, the Roy Moores, with money and with organization. And they can't do that. They need a story. And so what I think the Republicans need to do is first, the globalists need to say, "Hey, you're nationalists, we're globalists. We're going to tell a story. I believe in free trade, I believe in skilled immigration, I believe in global engagement." And the second thing they need to do is give up on Mitch McConnell and Paul Ryan. Because that kind of leadership, clearly in the Trump era, is not working. And I wish somebody like Bob Corker would form a gang, a gang of eight, a gang of ten, bipartisan Senators do their own tax reform, and actually sort of shake up all of Washington. That seems to me the only way out. By the way, we have it up so that people can follow the quote along. It is a great one. I think we have it here. Yeah, "I thought they were voting for libertarian Republicans." "But after some soul searching, I realize when they voted for Rand and Ron Paul and me in these primaries, they weren't voting for libertarian ideas, they were voting for the craziest SOB in the race. And Donald Trump won best in class." Right. And now Roy Moore has moved to the front of the class. So, here the Republican Party has really succumbed to this perpetual rage machine. And they can't turn it off. And not even Donald Trump could turn it off. So any of us that think that there's a policy answer for this, that there's just a few personnel moves, I mean this is something. I mean the beast has been released. And they realize that they can't ride it anymore. That's right. And I think, a civil war implies that both sides are still fighting. And I don't see the sort of, you know, the wing you talk about forming a gang. They're actually completely capitulating. They may complain to reporters on background. But in public, they're standing behind Donald Trump four square. They're completely capitulating to the rage machine in the party. They're in fear of their base. And they're not fighting. But at what point does the voter turn around and say, "What are the Roy Moores and Donald Trumps doing for me?" Is there any voter component here? Are they always going to be willing to be sold energy drinks? And have ask what the outcome is going to be for them? making liberals upset. Just be there. I don't think they care about policy. This is the definition of a dysfunctional government. This is America jumping the shock. Well, it's a culture war. And he's a cultural president, not a legislative president. But I think there's a good positive culture to be told that used to be the pioneer culture that built this country, that we welcome people in as long as they work, as long as they love each other, we're going to be a universal nation. That used to be the idea. We solved this problem. Yeah. Who is the flag bearer? This is what we keep asking. And we keep saying, "No, no, Paul, step up. No, no Mitch, step up." guy at the end of the bar. As opposed to being a governing party or taking philosophy or ideas seriously at all in this. In the general election. Governing isn't even important. Do you fear too many Democrats are sort of intoxicated by the idea of, "Well, let's go with our own grievance machine?" I don't think it's that. I think that Democrats are still enthralled to this idea that they can have back that Trump voter, that somehow they can win them back. That if they just offer them the right things and woo them in the right way, they can somehow win them back, rather than understanding that, at this point, the Democratic Party is the party of people of color, it is the party particularly of women of color, it is the party of the young. All right, I've got to take off. That's all I have. Thanks for watching. Seriously, we'll be back next week, because if it's Sunday, it's Meet the Press.